I had the luxury while on our sailing trip to read an entire book, start to finish. I didn’t just read it – I DEVOURED it. 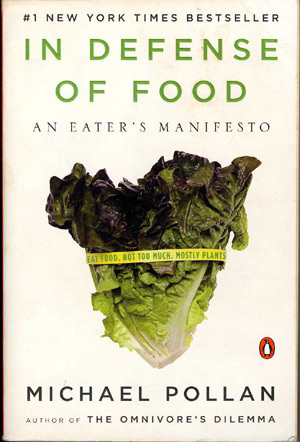 Fitting, then, that it was a book about food and eating: In Defense of Food by Michael Pollan. I’ve been a Michael Pollan devotee forever. I still remember where I was sitting when I read his brilliant essay, "Weeds Are Us," in the NYTimes Sunday Magazine. That wonderful meditation on the push-pull of nature and culture is in his book, Second Nature: A Gardener’s Education . But I digress. We’re talking food here. This book is so full of great observations, factoids for those of us who are info-obsessed, philosophy, and downright good sense. All packaged in Pollan’s signature intelligent, pleasure-to-read prose. It’s conversational, but not condescending. Among the MANY gems, three themes particularly spoke to me. Right off the bat, he makes the observation that good personal choices are usually good ecologically. I completely agree! It’s at the heart of our EcoBlueprint program; right down to my example showing how Thanksgiving dinner meets multiple needs beyond simple sustenance: family connection, aesthetics in choice and arrangement of the food, expressing love, giving care, pleasure, support of local economies, participation in the great cycle of life. I LOVE that he defends the pleasure of eating, and I’m just so glad that he’s not the only one singing that song lately. Another great theme is that of food relationships. In nature, food is all about relationships among species: we call them food chains. Pollan takes a clear-eyed look at our place in this chain. Who better to guide us than the man who has spent much of his writing life on the topic of the intertwining of nature and culture? Culture, he says, has played a critical role in helping to mediate people’s relationship to nature. Eating is one of the most important manifestations of that relationship. This is likely why, in the ever-growing sustainability movement, food is often a first entry point. We all have to eat! Buying our food directly from farmers is an excellent way to experience this connection . Pollan’s advice is to shake the hand that feeds you: meet the people who grow and raise the food you eat. In another brilliantly creative passage, he likens traditional diets to vernacular architecture . In both cases, he observes, a long, incremental process of trial and error helped cultures discover what works: how best to reconcile human needs with whatever nature has to offer us in a particular place. These foodways and buildings tie us to place in profound ways, such as adaption to climate , that we now do well to re-discover. Indeed, one of the most galvanizing passages in this book is his definition of what is essentially a design problem for the 21st-century. In response to earlier advocates of going entirely backwards to the diet and lifestyle of our ancestors, Pollan neatly sums up our challenge. We must today discover how to escape the worst elements of the Western diet and lifestyle without going back to the bush. This has an uncanny alignment with the best of today’s green architecture movement. When we look for a marriage of traditional know-how and modern technology, we open to new possibilities. We don’t have to undo or throw away the last few centuries of learning and advancement. We can instead choose the best from both worlds, forging a new way forward. Pollan was recently in Baltimore, hosted by Baltimore Green Works and the Enoch Pratt Free Library . There were close to 1,000 people crammed into the library’s magnificent central atrium. It was thrilling to see that food is such a hot topic here. "Eating with the fullest pleasure – pleasure, that is, that does not depend on ignorance – is perhaps the profoundest enactment of our connection with the world. In this pleasure we experience and celebrate our dependence and our gratitude, for we are living from mystery, from creatures we did not make and powers we cannot comprehend." I strongly agree with your comments about food and food relationships; and it is encouraging to see that food, and the nutrition food provides, are finally getting attention supportive of our well being and that of the Earth. For me, enjoyable living is so intertwined with good health and good food that the point where health begins is also part of this discussion; and that starting point is the cell. A book I have recently written highlights this viewpoint and I want to draw it to your attention, as you may be interested in it. The title is “Soul Talk With Cells: What We Really Want Is To Play” and information is available at http://www.strategicbookpublishing.com/soultalkwithcells.html If you have any questions, I am most willing to offer my views on this topic. Hi Julie, that was a great intro to Michael Pollan’s book. Thanks for the condensed synopsis. I guess that will get most of us interested in reading the book for ourselves. Yes, the points you’ve outlined do make a lot of sense. A systematic study of the relationship between each species in the food chain would certainly put things into perspective. I heard Pollan only once, but he made a believer out of me fast. An interview I heard with him plus the movie Food, Inc. has turned me organic — not just for my own health but also for the health of the planet. Thanks for this solid, easy to communicate message that makes it easy to share the importance of real food with others.